Do you have Winer hair blues? I know our east coast friends are having a harsh winter with the trending hashtag, ‘polar vortex’. I partnered with HSN Community to share their fixes for limp, dry hair! Ah, Winter … It’s a wonderful time of year for you, but how about your hair? Warm nights by the fire are lovely, except for that super dry air! Crisp walks in the snow could not be more refreshing, but who loves the static effect on your locks? And never mind accessorizing with all those chic hats … the aftermath can be less than stylish! But just as you change up your skincare routine for drier days with a richer moisturizer or a creamier cleanser, a few simple changes to your hair care routine can winterize your tresses and keep dry ends, flat looks, and static frizz at bay. Dry air and indoor heating can parch your hair during winter months, so switch your everyday shampoo and conditioner to a sulfate-free routine. These cleansing agents, found in many shampoos, can strip moisture and colorant from hair – so moving away can keep your color fresh too! Look for products free of moisture-stripping sulfates and rich in ultra-hydrating monoi oil. If you’ve heard about the benefit of skipping shampoo days but haven’t yet given this a try, winter can be a great time to give your hair and scalp a break, allowing your own natural oils to rebalance. Scalp health is essential for great hair, and if your face gets dry in the winter, imagine the state of your poor head! But don’t worry, you don’t have to actually avoid the shower … I love a creamy cleansing conditioner like Carol’s Daughter Hair Milk Co-Wash – it has just enough cleaning power to leave hair feeling refreshed, and just enough conditioning effect to leave it smooth without weighing it down. If you can’t leave home without sleek tresses, winter is the time to be extra vigilant about protecting your hair from the stress of heat styling. To lock in moisture while you’re styling, try an at-home keratin treatment. Some hair straighteners and styling tools come with features that can actually help your hair, like: keratin packs, or spray through, leave-in, keratin treatment before firing up your favorite tool. Winter air is usually low in humidity, which makes for static-y flyaways and, you guessed it, drier hair! I love saving time (and money) by picking up a moisture-rich hair cream, which doubles as a styling aid and conditioning pack. I use the lightest touch on hair before I throw on my knit hat, and about once weekly I apply it throughout my hair and wrap in a just-from-the-drier towel to create a deep moisture treatment. Low humidity can also be torture for fine, thin hair, but that’s nothing a good night’s sleep won’t cure … I swear! Taya Amazon White Clay & Acacia Collagen Overnight Hair Plumper works while you’re sleeping to inject hair with va-va-voom volume by morning, and starting your style off right. Even if I’m not jetting off somewhere chic, I love to pick up a travel set or two for the winter season. They offer great value and a chance to try something new – but even better, they ensure I have mini tress-tamers at my fingertips for those hat head moments when arriving at the office or an event. Amika’s Jet Set Hair Care Survival Kit contains their cult Obliphica Leave In Cream – perfect for smoothing frizzies. 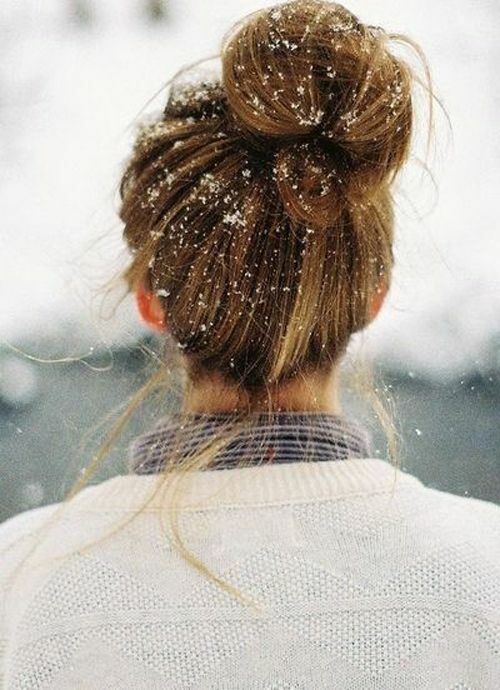 With a few swaps and simple tricks, your hair will enjoy the wonders of winter as much as you do! Definitely want to try Taya Amazon White Clay & Acacia Collagen Overnight Hair Plumper, sounds awesome!!! Your tips are GREAT!! Keep them coming! !